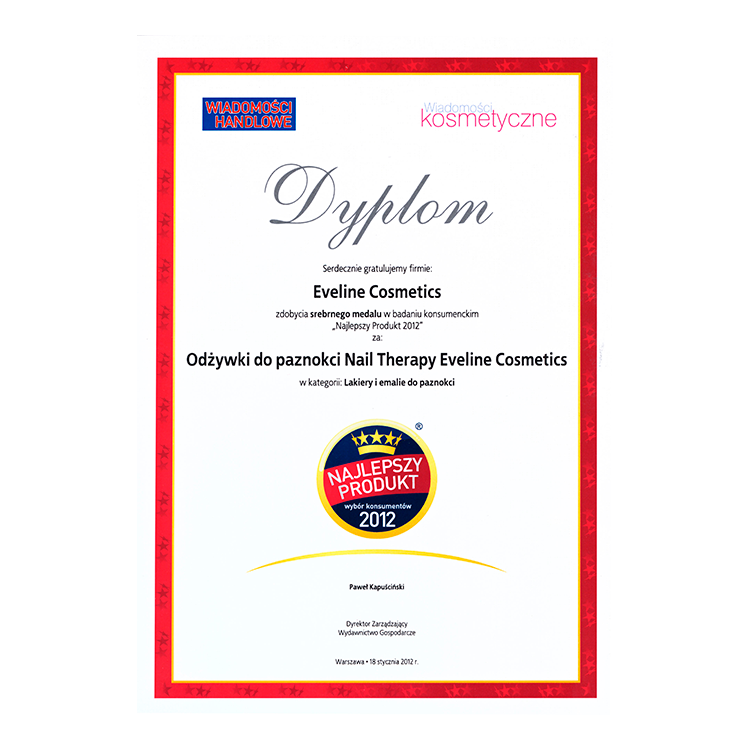 Nail Therapy treatments by Eveline Cosmetics are the laureate of silver medal for „ Best Product – Consumers Choice 2012”. This placed Nail Therapy treatments by Eveline Cosmetics among best cosmetic products on Polish FMCG market chosen by consumers in one of the biggest such surveys in Poland. The „ Best Product – Consumers Choice 2012” survey was carried out by GfK Polonia Institute on the commission of Wydawnictwo Gospodarcze (Economic Publishing House) – publisher of branch magazines „Wiadomości Handlowe” (“Trade News”) and „Wiadomości Kosmetyczne” (“Cosmetic News”). New products launched on Polish market from 1st November 2010 to 22nd November 2011 were the subject of the survey.